An emulation of a Kawai K1 digital synthesizer from 1985. Rumble K2 Builder is a Rack Extension for Propellerhead Reason 7.1 or higher. Rumble K2 Builder is a digital wavetable synthesizer and is an emulation of an additive wavetable Kawai K1 digital synthesizer from 1985. This Rack Extension mimics the operation system and the naming conventions on a Kawai. The patch library consists of 96 sounds, a true emulation of the ROM Pack A from the Kawai K1. Additional 120 signature patches made by Navi Retlav, Loque, Eusti and RikkShow. This version of the Rumble K series comes with Sine, Saw and Square oscillators, a Shaper, an Amp Envelope section with DAHDSR controls, Vibrato, Auto Bend, Pitch Wheel, Low Pass Filter and Frequency panels, 7 effects devices and 7 modulation matrixes with in total 13 slots. Have a collection of the original instrument patches of the Kawai K1. Transfer sounds from the Kawai K1 and build patches for use in Reason. Have a lofi 8 bit character synthesizer as an addition and counterpart of synthesizers with very clean oscillators. Make lofi sounds or instruments for use in genres like hip hop, but also wants to use emulations of classic sounds like the Roland TB 303 bass synthesizer, the raving Roland Alpha Juno Hoover instrument and the Roland JP 8000 trance Super Saw sound. 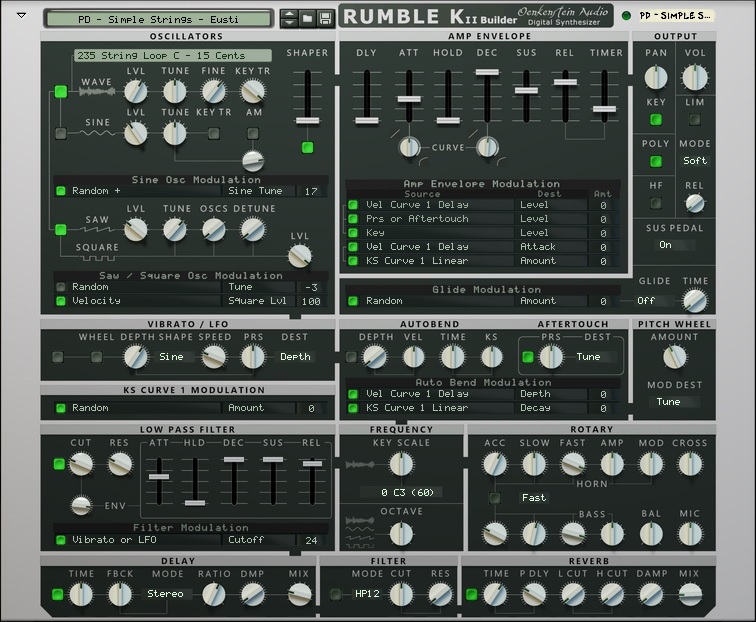 Rumble K2 Builder uses additive wavetable synthesis to generate sounds. The additive synthesis is based on a Wave oscillator using waveforms, just one of the in total 4 oscillators that can be introduced in the sound at various times, levels and durations. The sonic results of additive synthesis can vary dramatically; from standard analog type of synthesizer sounds, via emulations of existing instruments, to extremely complex and animated timbres. The other 3 oscillators are Sine, Saw and Square wave based oscillators and are mixed with the Wave oscillator. The Sine Oscillator features Amplitude Modulation (AM) and modulates the Wave oscillator. Minimal requirements for the Rack Extension: Duo Core based computer with at least 2 GHz processor, 4 GB of RAM and Propellerhead Reason 7.1 or higher running on Windows or Mac OSX. Type of device: Digital synthesizer. Method of synthesis: Additive 8 bit wavetable synthesis combined with extra analogue style sine, saw / square wave oscillators and amplitude modulation. Amount of oscillators: 4. Wave oscillator, Sine oscillator, Saw and Square oscillators. A Shaper on the oscillator’s output. Bus 1: Lofi and Filter. Bus 2: Delay, Rotary, Phaser and Chorus. Bus 3: Reverb and Limiter. 1. Sine oscillator modulation (1 slot). 2. Saw / Square oscillator modulation (2 slots). 3. Amp Envelope modulation (5 slots). 4. Auto Bend modulation (2 slots). 5. Filter modulation (1 slot). 6. Glide modulation (1 slot). 7. KS Curve 1 modulation (1 slot). 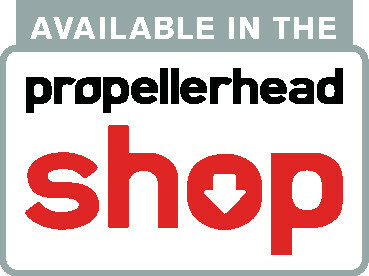 Rumble K2 Builder Rack Extension is available at the Propellerhead Shop. Price during the 'Introduction price' period: Euro 29.00. The price reduction last until March, 10, 2019.